I don’t usually indulge in high-end products. If you look through my archives you’ll definitely come across a few here and there, but nothing excessive. While I do appreciate a little luxury every once in a while, I’ve always felt I could get a more budget-friendly product that is very similar (and in some cases even better). But once in a while something will catch my eye and I’m convinced I need said item to keep my collection looking shiny and glamorous. 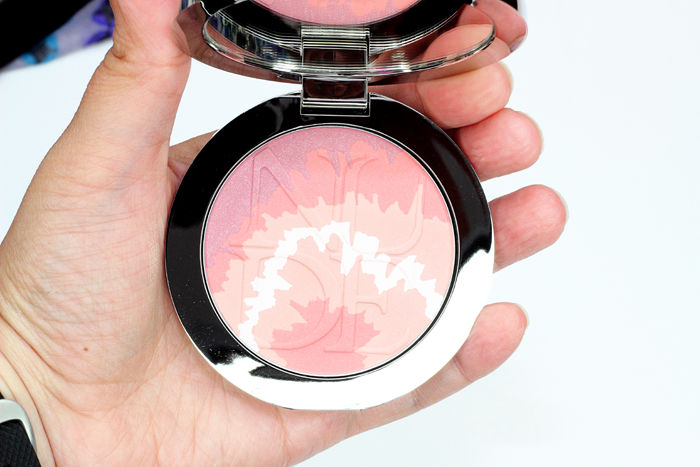 When I saw the promo photos for the Dior Tie Dye Collection I just knew I needed one of the blushes. Thanks to my wonderful husband and son I was able to add Pink Sunrise to my collection this past Mother’s Day. My guys spoil me. The packaging is pretty and all sorts of luxurious. 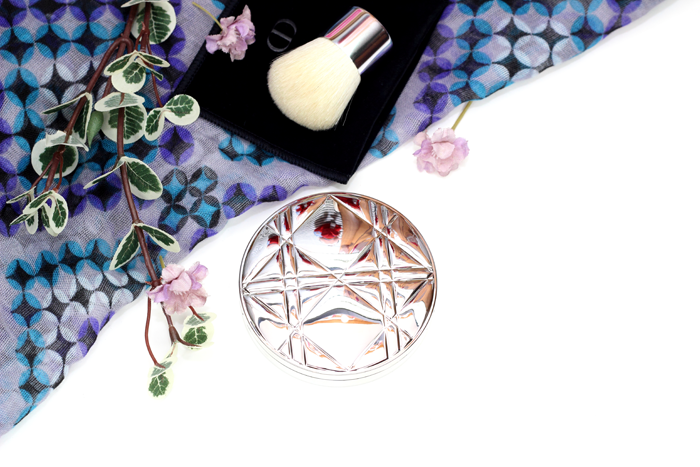 The blush even comes with a kabuki brush. I rarely use the brushes that come along with my makeup, but I definitely used this brush. It was easier to swirl around in the pan picking up all of the shades. 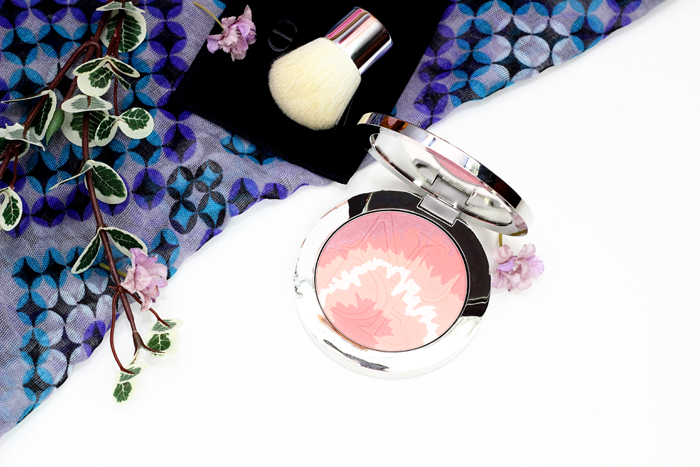 The blush itself is just TOO pretty! I was half afraid of digging into it because I didn’t want to break it in. A beauty like this needs to be displayed! But at the same time it would be a shame to never put it to work. 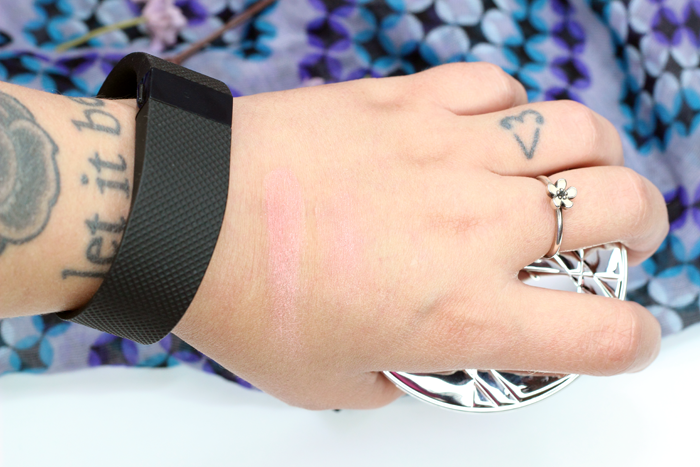 Beauty blogger problems. 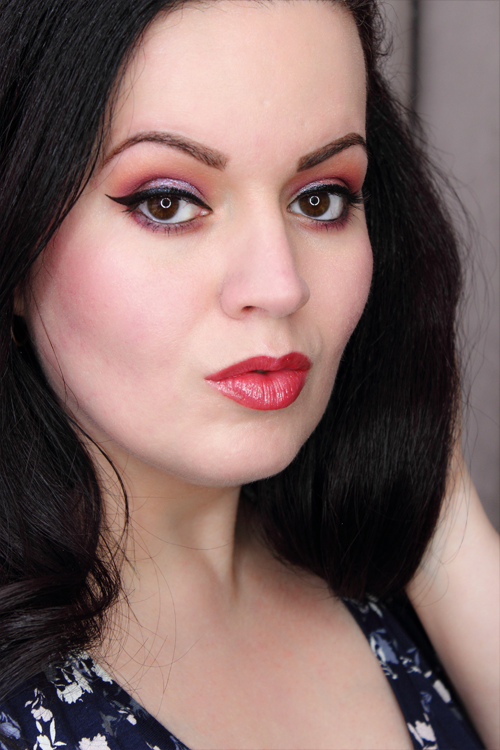 It applied and blended effortlessly. I was afraid it would barely show on my skin, but with a little building up it looked great! It added a wonderful pink glow to my cheeks. It’s beautiful and I love it! The perfect addition to my collection. You can see it in action below. 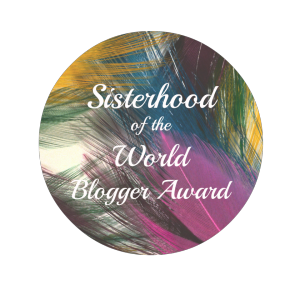 I was nominated by the wonderful Zovesta for the Sisterhood of the World Blogger Award. I’m pretty excited to participate because I love reading everyone’s questions and answers. Thank you, Zovesta, for nominating me! 2. Do you own a vanity for your makeup? I currently have a desk and a toolbox. My toolbox stores all of the goods and I apply my makeup at my desk. 3. Library or movie theater? I’d have to say the movie theater. My family and I do a lot of movie nights. 4. Do you watch plays ever? I haven’t, but I’d love to! 5. What’s the worst beauty purchase you made lately? I purchased a Cover FX Contour Palette last month that just didn’t work for me. Like at all! 6. Favorite TV show? The Walking Dead!!! 7. Do you play games often? Once in a while we (my family) whip out the Monopoly. We used to get down to some Rock Band and Dance Central too. It’s been a while though. 8. Who is your makeup idol? While there are many talented MUA out there, I’d have to say Kandee Johnson. 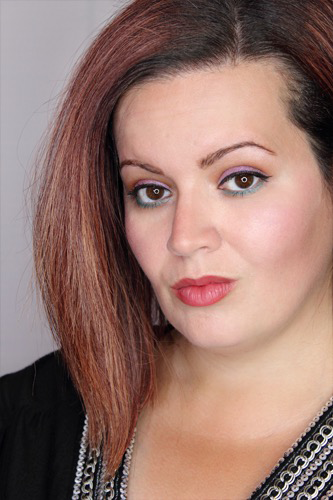 Not only is she an incredible MUA (Have you seen her transformations? Sick! ), but she’s got such an amazing upbeat personality. She never fails to make me smile or laugh. You can just tell that she loves what she does. 9. How do you like foreign movies? I’ve seen a few (my husband loves watching them). While I don’t mind them, I don’t go out of my way to watch them. 10. How would you describe your wardrobe? I guess casual? I don’t do the dressy thing unless I really have to. I don’t wear heels because I’m pretty sure I’ll break something. I’m a jeans and flats kinda gal. 2. What’s your favorite makeup collection? 4. If you could travel anywhere, where would you go? Why? 5. If you were going on a trip and could only bring ONE makeup item, what would you bring? 6. What’s the last movie you saw? 7. Ever try something you saw on Pinterest? How did it go? 8. What was the last good deed you did? 9. 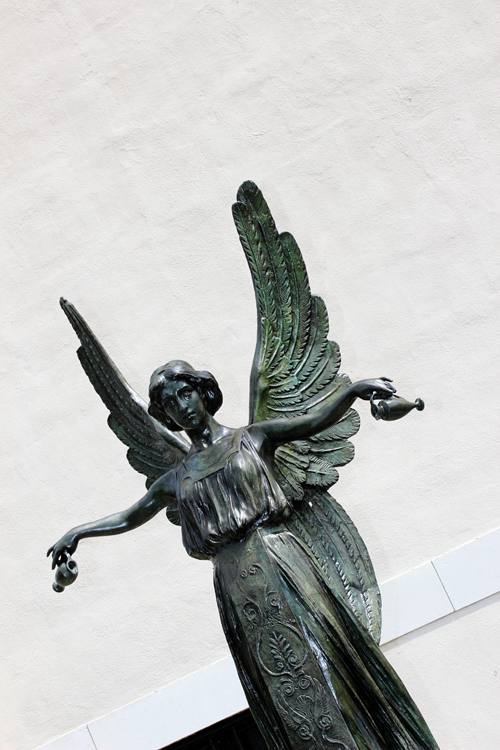 What’s the best thing someone could give you right now? 10. If you could sit and chat with ANYONE for an hour, who would it be? I hate to be a rule breaker, but I don’t think I even know 7 bloggers to nominate lol. Sorry! And y’all don’t have to participate if you don’t want to.